The Public Hall with the “winding room” on the bacony, which was there from 1919 to 1926. The ghostly building behind is the water tower. Mr Newman was born in 1908. The film shows which he was speaking about, were running by 1916, and continued until the 1920s. They aren’t as well known as the Whitehall cinema which opened in 1928. 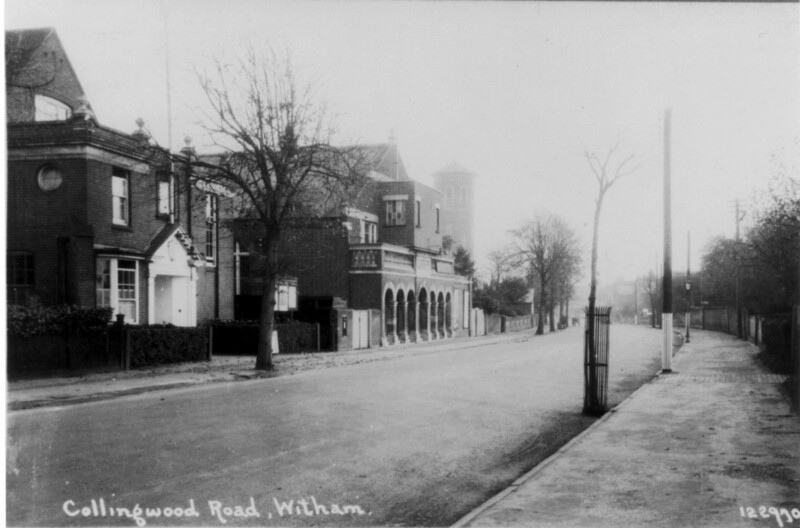 But they are of special interest at the moment, when the Witham Public Hall Trust is planning to start showing films again. Before Mr Clarke took over, the cinema had actually been started by William Pinkham, who owned the glove factory (where the Templemeads flats now stand in Chipping Hill). The cinema was discussed in 1916 at the appeal for his son Bert against joining the forces. Conscription had just been introduced. The military gentlemen in charge had heard about the cinema, and the fact that Bert spent all his spare time looking after it. They implied that if he had enough spare time for such frivolous pursuits, he couldn’t be as essential to the business as his father claimed. There were several appeals, but Bert did have to join up in the end. And Mr Walter Peirce remembered “a little old petrol engine round the back that used to make the electricity, perhaps the belt would come off the engine or something like that, or the engine conk out, we used to bang and stamp our feet and wait for the films, used to come on again”. When the film broke it had the same effect. They’d “get half way through and the film would break, and everybody’d holler and stamp their feet”. Mr Peirce also said that “The projector room was built outside, over where the ornamental stonework was. The doorway is still there what used to come into the projector room, then you put the film over the top of the gallery.” Perhaps it’s not surprising the film broke sometimes ! This room wasn’t installed until 1919. It’s shown on the photo.